I am in SW Portland, John’s Landing area, off SW Macadam Ave. Group classes are at the nearby Korean Presbyterian Church. AM I ACCEPTING NEW STUDENTS? Yes! Contact me for scheduling. I THINK I AM READY TO LEARN MORE. WHAT IS THE NEXT STEP? Send me an email through the contact form, and we can arrange a phone conversation to figure it out. I teach Tuesday to Friday, and Saturday mornings. Limited availability, so contact me now! If you are on free or reduced lunch, I have ONE significant scholarship available and free and reduced cost materials too. I am a ‘musiclink’ teacher. If you are not on reduced lunch, but believe yourself to have other financial considerations, please do not hesitate to ask. I believe cost should not be an impediment to regular lessons. Scholarship options are available. Everything your child does in life will be better for having practiced their instrument. I want you and your child to experience emotional freedom, not to be tied down by past experiences, but lifted up by them. Learning music through violin is the path to this freedom. Whatever occupation or activity they pursue, they will do it better, enjoy it with more balance, for having practiced violin. For some, a regular visit to a church community connects someone to the divine. I hear the divine in sound. I can reach for that aid alone or with others, and make music that others enjoy that gives a wonderful feeling for all to share in together. An experience that brings people together. The world urgently needs more of that right now. There is an oft misquote attributed to Aristotle, “We are what we repeatedly do. Excellence, therefore, is not an act, but a habit.” (Will Durant, North Adams, Massachusetts, 1885-1981, in his book, “The Story of Philosophy: The Lives and Opinions of the World’s Greatest Philosophers.” An instrument, violin, is a powerful vessel to teach a child why such a habit is worthwhile. YES. Definitely. Sight unseen, he or she will be like other kids, and be a product of his environment. If you want it for your child, then we will make it happen together. One aspect of this is that the child isn’t already being asked to do many different activities. Kids need rest, and child-directed play time as well. Give me a call and we can talk more about your child. 503 577 four three 48. I love teaching a variety of ages, but I find that kids that are about 6-12 years of age are the ideal fit, and specifically those children that have parents who are able to support the child in that goal by spending time with them. No prior musical experience necessary. Adults of all ages can be successful, and I particularly enjoy working with multiple grandmas in my studio currently! If your child is 3 or younger. I STRONGLY encourage enrolling in a Suzuki Early Childhood education class (SECE) for your son or daughter if age 1-3, as they develop the skills needed for early instrument study, and help parents strengthen some of the habits that lead to Suzuki success. THIS IS HANDS DOWN THE BEST WAY TO PREPARE YOU & YOUR CHILD TO BE SUCCESSFUL IN LESSONS. We are very lucky to have a class in Portland! Visit “DaCapoSECE.com” for classes! I AM READY TO DO WHAT I NEED TO DO TO MAKE THIS HAPPEN! WHAT IS THE NEXT STEP? Send me an email through the contact form, and we can arrange a phone conversation to figure it out. Talking with me, and observing a lesson or two is a great way to take advantage of the natural learning method. Ideally daily practice of about 20-30 minutes to start depending on the age and ability. There are weekly individual lessons and every other week group classes on Saturday mornings. DO YOU ONLY DO CLASSICAL MUSIC? No! I am a lover of bluegrass, some Jazz (Bebop & Swing to name two), fiddle tunes (New England, Scottish, Irish, Old Time and more), rock and more. We primarily use a classical repertoire to study until the advanced stages, but we will incorporate some other tunes as need and interest dictate. Tell me about your interests. HOW TO PROCEED IF I WANT TO LEARN MORE, OR TO SIGN UP? If you are interested in lessons for your child, go to my ‘contact‘ page and send me a note which includes a phone # and times to reach you. I like to hear a little bit about you and your family to confirm that violin is a good idea for you/your child in your situation, and to clear up expectations and logistics. Signing up for violin lessons is a bigger commitment than, say, swim lessons, hence the phone call. If you want to learn more about me, check out my blog. Click here! 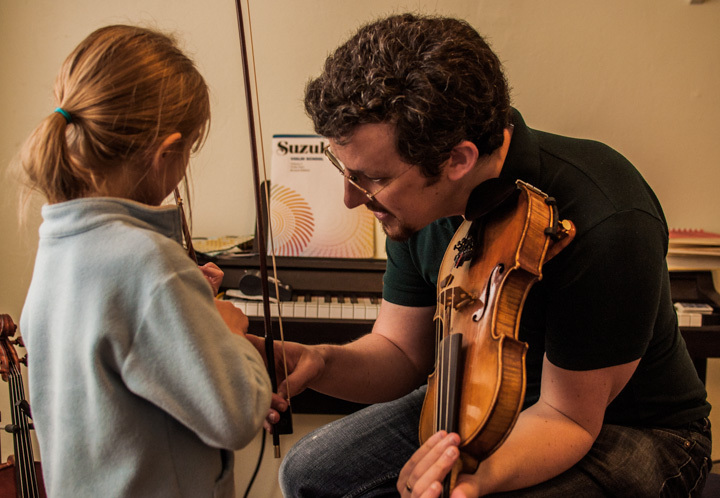 Daily practice of 20-45 minutes is a reasonable goal for successful, enjoyable violin study to start, though that can be worked up to, especially with young children, and new practice parents. Adults that wish to learn (from scratch or to pick up an old instrument!) should expect to put in just as much time. Yes! They have included both new players starting from the earliest stage, to those getting re-acclimated. Everyone ranging from from HS graduate to grandmas looking for a retirement activity. It is possible to start as an adult and have a satisfying practice. May I impress upon you the adult, however, that regular time, week in week out, month in month out, is particularly important, and much more challenging as family, vacations, etc. regularly can interfere with momentum. So if you want ability, we will apply knowledge to repetitive action. As such, time is the primary ingredient to success and enjoyment. Your desire to succeed, organizational skills and receptiveness to coaching will maximize the time you spend. A blue collar workman like approach is your biggest asset. 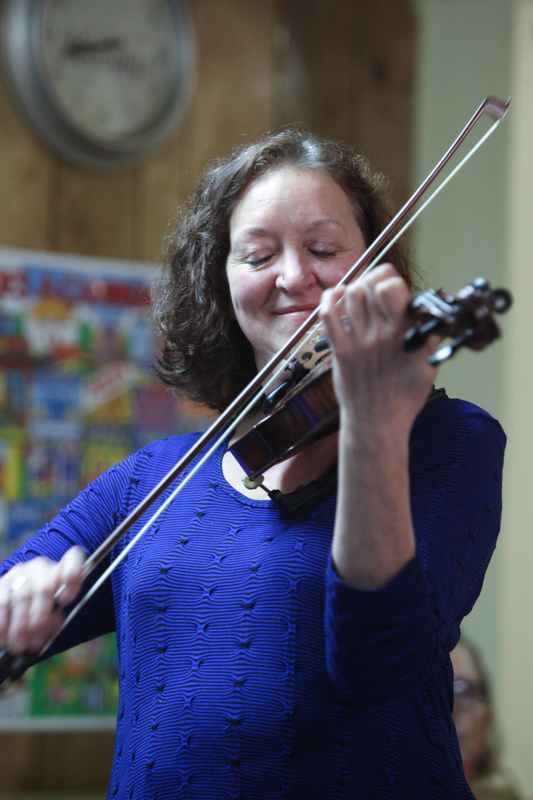 I particularly enjoy helping the motivated adult discover the joy of playing violin or viola. The practice is spiritual in its own way. DID YOU KNOW THE KNEW (MID)LIFE CRISIS CURE IS TO USE YOUR CREATIVITY! A recent NY Times article, linked below (possibly behind a paywall if you’ve used your free articles), discusses how more than ever exploring creativity is what people are looking for later in life. I have a wealth of musical and technical knowledge, but my real joy comes in just helping people of all ages ENJOY their music. Music is an art with a little science in it, but most of all it is a reflection of being human, and our life force. Join me for a free first lesson so I can give you some of the tools to unlock your musical creativity. WHERE TO BUY AN INSTRUMENT? Geesman Fine Violins, David Kerr, Caitlin Pugh Luthier Studio, Kennedy violins in Vancouver, and a few others I have good experiences with. Sharmusic.com is an online shop that has some good merchandise. The shop should be in the business of repairing and working on violins, otherwise it’s just a middleman marking things up. Schuback violin shop is excellent, though he just moved to Newburg. Lesson fees are commensurate with other professionals in the area. Please contact me for details. However, I was the beneficiary of multiple very generous teachers as a child so I also offer income based payment. Ask me about scholarship options. Also, if your family is blessed with the means, I also accept donations towards others. Lesson fees for individual and group lessons for the months Sept-June are at a set monthly rate according to your lesson length. The monthly fee will include all recitals, group classes, individual lessons, SAA membership, and parent education sessions. The monthly fee will be due for each month due at the last lesson of the prior month. The rare teacher miss will lead to a credit for the July/Aug months, or a holiday lesson week makeup, or if enough build up a free month’s tuition! I teach July & August too, but those months are billed ala carte, as are extra lessons during major holiday weeks. If you are too sick to come to lesson, but well enough to still play, I offer the occasional facetime or skype option that can be used during your regular lesson spot. Facetime and skype options are available when working properly! Lesson fees are done on a fixed monthly rate, so no makeups. However, please inform me prior to your lesson if you expect to miss it as a courtesy. If you give 2+ weeks notice, we can try to reschedule the lesson at another time mutually agreed upon during the same week. Switching with another student of the same length is also possible. For lessons September to June, as your time slot is reserved for you, no make ups or credits are provided if you miss a lesson as expected missed are factored into the yearly cost already. Though I have yet to use it, I reserve the right to have 1 sick day per day of week per year (aka, one for Wednesday, one for Thursday, etc.). If I have to miss more, or miss a lesson for any other reason, I will provide a makeup lesson, or a credit for future ala carte lessons, or similar remedy. I WANT TO SIGN UP OR LEARN MORE. WHAT ARE SOME OPTIONS? Talking with me on the phone, and observing a lesson or two are great ways to take advantage of the natural learning method. I also offer a complimentary first lesson so you can get to know me risk free. Send me an email through the contact form, and we can arrange a phone conversation to figure it out.